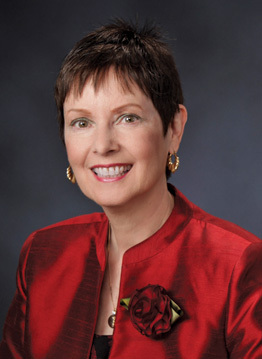 “I am happy to dedicate my time to the ACOI as a member of the Board of Directors because I believe ACOI best represents my practice and benefits my patients. My professional and personal goals align most closely with the College. I took on the role of Development Committee Chair because I believe, as we transition from a GME to CME organization, it is very important that the ACOI become stronger for the next generation of internists. Young internists should understand the need for funding the College’s mission and values which benefits all our members’ practices and, most importantly, their patients. I see the Development Committee helping to get those messages out to long-time and new ACOI members. 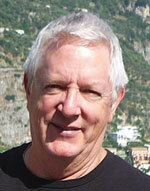 The ACOI’s Sustainers Club is growing! Help the College Better Plan for Its Future! Remember, your gift is tax-deductible to the full extent allowed by law. Sign Up Today by clicking this link and checking the monthly gift box to make a credit card contribution. “As an osteopathic internist and ACOI leader, commitment to our organization is important. The ACOI needs a strong infrastructure financially to be able to support its mission. I am passionate about being an Osteopathic Internist, therefore, it is natural and credible for me to support this organization with my time and finances. 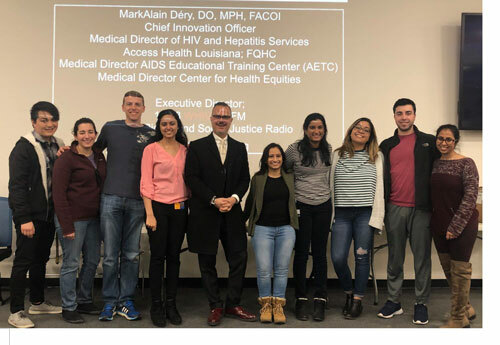 “Financial Support of the ACOI is essential to ensure the continued progression of the College’s mission “To advance Osteopathic Internal Medicine”. With the rapid technological advances in Internal Medicine, our Osteopathic heritage MUST be interfaced, as technology cannot treat our patients without human/osteopathic Input. The ACOI is in an exceptional position to advance medical knowledge, professionalism, patient care, and physician excellence. Osteopathic Internists can serve this mission and our patients by involvement in the ACOI committee structure sharing knowledge, professionalism and service. I have chosen to support the ACOI and the 75th Anniversary Campaign with a commitment of time and, of course, financial support. I hope others will recognize the need for involvement both financially and academically as medicine and science progress with rapid acceleration." The ACOI is especially grateful to Larry Haspel, who served as Campaign Chair, Marty Burke, Campaign Vice-Chair and the members of the 75th Anniversary Campaign Committee listed below for their generosity and leadership that helped insure the success of the College’s first-ever comprehensive fundraising campaign. We are now accredited by the ACCME to be a provider of CME that qualifies for both AOA and AMA credit, and meets the recertification requirements of both the AOBIM and the ABIM. ACOI is utilizing the funds raised for the 75th Anniversary Campaign to create a home for those who believe in the patient-centered, osteopathic approach to healthcare that we call Principle-Centered Medicine. 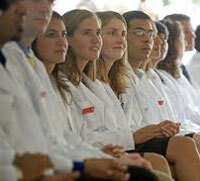 Our promise to members is to help you stay true to why you entered medicine. The College is transforming from a Graduate Medical Education and Continuing Medical Education organization to a Professional Services Organization. We have created a community of learning through the enhanced use of technology. Our new ACOI Online Learning Center allows the College to offer CME when, where and how our members need it. The ACOI will continue to emphasize the distinctive osteopathic approach that is both beneficial to patients and valued by them in all our continuing medical education offerings. The ACOI continues to provide hands-on assistance to residency programs as they seek allopathic accreditation, and to encourage them to secure Osteopathic Recognition as they make the transition. This will assure that the distinctive osteopathic philosophy imbued in students during their medical school years will continue during residency. It is gratifying that virtually all of the ACOI internal medicine programs that have been reviewed by the ACGME have been granted initial accreditation. Working collaboratively with other organizations that would further the ACOI’s promotion of high-quality, patient care has resulted in ACOI securing an ex officio seat on the ACGME Residency Review Committee for Internal Medicine, as well as full participation in the Internal Medicine Education Advisory Board. These interactions provide the ACOI with powerful new partners and allies and afford the College the opportunity to continue to influence internal medicine residency training beyond the transition. A task force has been formed to develop and communicate a plan for integrating osteopathic principles and practices into the College’s programs, products and services. The recently-completed 2019 ACOI Member Survey revealed that almost half of members use OMM at least some of the time in their practices. The ACOI Board recognizes that, while not defining osteopathic care, manual medicine should be a meaningful part of the discussion about osteopathic distinctiveness. The task force is developing practical mechanisms for integrating osteopathic principles and practices into the continuum of education. To address the growing problems of stress, burnout and suicide that are the result of systemic issues affecting physicians today, the ACOI has created a task force on physician wellbeing that includes members, residents, and students. Its charge is to identify the problem and its sources, refer members to appropriate resources, and focus on fixing the causes of the problem in collaboration with other groups. Strengthening the AOBIM and assuring that its credentials remain viable for all who already have them, as well as those completing training. The AOBIM, a separate organization from the ACOI, is currently managed by the AOA. "I felt it was a privilege to speak at the 2018 Convention so was happy to donate my honorarium. I want the ACOI to continue and know that additional resources are needed. I don’t want it to lose its identity. It was fascinating reading the 75th Anniversary History Book that Kevin Hubbard, DO, MACOI wrote, learning about A.T. Still and others. I encourage others to support the College financially so that the traditions of osteopathic internal medicine can be preserved." If you are interested in making a contribution, please click on this link. The most popular way generous people help the American College of Osteopathic Internists is with an outright gift of cash or stock. However, some find that they can also help by making a legacy gift which is a wise investment for securing the College’s future. It enables ACOI to plan long-term for strategic activities such as developing new initiatives critical to osteopathic internal medicine, creating more educational and training programs, and expanding outreach programs. With a secure financial base, ACOI can be more innovative and creative in cultivating new frontiers and serving the needs of its members. A legacy gift can even be designed to obtain current income and estate tax advantages. It can also provide income to you or your loved ones for life. Although many complex options are available, there are simple options easily created through estate planning vehicles. A donor may never see his/her legacy gift bear fruit, but he/she will know that the legacy, along with his values and beliefs, will have an impact on future generations. Through legacy giving, ACOI’s mission and vision are strengthened, regardless of the challenges that may lie ahead. To recognize and honor ACOI leaders and members who include ACOI in their will or estate plans, the Legacy Society was created. These legacy donors are giving back to ACOI while at the same time helping to secure the College’s future. By naming the College in your will you can give general support or name a specific program or service you want to help. Most people provide a percentage of what’s left after they have made provision for their family. A fixed dollar amount can be mentioned as well, but some find that a percentage is easier and doesn’t need to be reviewed as time goes by. “I give, devise, and bequeath to the American College of Osteopathic Internists, a tax-exempt organization, located at 11400 Rockville Pike, Suite 801, Rockville, Maryland 20852, the sum of $__________ or percentage of (cash, real or personal property herein described) to be used for the specific purpose of ________________ or general purpose of the American College of Osteopathic Internists at the discretion of its board of directors. By establishing this special gift arrangement, often called the gift that gives back, donors receive a generous tax deduction and get money back for themselves or for themselves and one other (usually a spouse) at an attractive interest rate for their entire life. You can ask for a confidential personalized illustration of how this can work for you, particularly now with low-paying CDs and low interest rates. For younger ACOI members, establishing a deferred gift annuity can provide supplemental retirement funds in the future. By naming ACOI the recipient of retirement plan proceeds many can avoid negative estate tax consequences while helping others and providing heirs with other less-taxed assets. You can ask ACOI to see if this can reduce your estate tax liability. By establishing one of several different types of trusts with either fixed or variable payments, savvy ACOI donors dramatically reduce their estate taxes, avoid probate, shelter funds for themselves and their family and receive a generous tax deduction. Ask ACOI how and for a confidential personalized financial illustration that will be tailored to your unique situation or needs. By donating a house or property you no longer need, you will receive a generous tax deduction based on its full market value. By keeping the right to live in your home for life or until you no longer need it, you can stay in it and receive a generous tax deduction. Ask ACOI to show you how this can work for you. Many people have insurance policies they no longer need. By making ACOI the owner and beneficiary, you will receive an immediate tax deduction and the joy of knowing that what once gave you and your family peace of mind will now help others. Ask ACOI how this can work for you. Our staff and planned giving counsel are ready to provide confidential information on ways you can help yourself and your family, while making gifts that will go on to help ACOI and others. For more information or to schedule a consultation with our planned giving counsel, call Brian Donadio, FACOI, at 301-231-8877 or email him at bjd@ACOI.org with any questions you might have. For more information on the various types of planned gifts, please contact Katie Allen (katie@acoi.org) to order copies of various gift planning pamphlets now available: Gifts of Securities; Your Will to Help; The Gift Annuity; Ideas for Retirement; A Special Beneficiary; Art of Gift Planning; When the Time Comes; Your IRA Legacy; Remarkable Unitrusts; Bequeath Your Values; Planning for Women. Evidence mounts daily that the national demand for internists is growing. There is a strong need for highly-qualified primary care internists, hospitalists, and subspecialists. ACOI answers this need by reaching out to students who are not fully aware of the career opportunities in our specialty. ACOI is committed to the future of a distinctive osteopathic practice of internal medicine and to strengthening and expanding our very successful generational advancement programs so that future generations can carry on our osteopathic traditions and practices. ACOI sponsored Visiting Professor lectures during the 2018-2019 academic year, thanks in part to contributions from ACOI members! 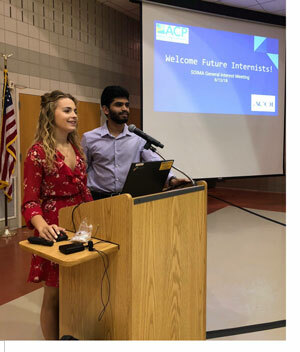 Oksana Vasylivna Mayovska and Sanath Shetty, 2nd Year medical students at Rowan University School of Osteopathic Medicine in Stratford, New Jersey who currently serve as the Co-Presidents of the Student Osteopathic Internal Medicine Club. 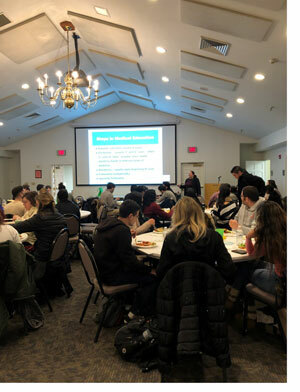 On March 4, 2019, ACOI President Annette T. Carron, DO, FACOI traveled to WVSOM as a visiting professor and delivered her lecture "How to Succeed on Rotations." What a great turnout! Pictured with Dr. Dery is Sebastian Geraci, Ann Jose, Zai Ganesh, Ooha Kambhampati, Kim Soultan, Daniel Francis and Sneha Chittabathini. 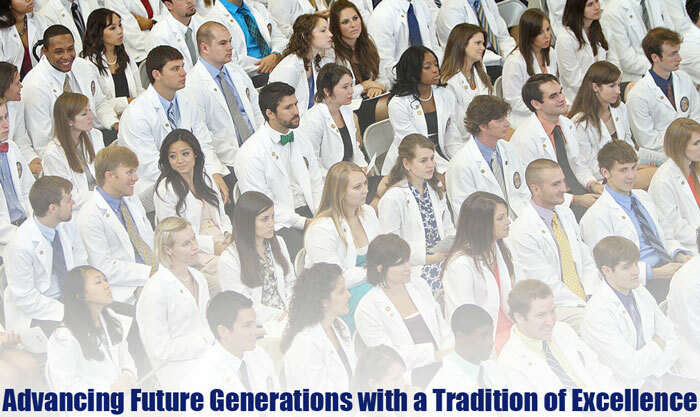 ACOI is committed to the future of a distinctive osteopathic practice of internal medicine and to strengthening and expanding our very successful generational advancement programs so that future generations can carry on our osteopathic traditions and practices. This commitment requires financial support over and above ACOI dues so we can continue to make a difference in providing high quality care to patients. Send a check to Katie Allen, ACOI, 11400 Rockville Pike, Suite 801, Rockville, MD 20852. Add a contribution when renewing your annual dues. Add a contribution when registering for the ACOI Annual Convention or other educational conferences. For information on how to make a gift of stock, please contact Brian Donadio, Executive Director, at 301-231-8877 or via email at bjd@acoi.org. Make a gift in honor or memory of a colleague, mentor, teacher, or someone who has been important to your career or personally. Be certain to include the complete name and address of the honoree or their next of kin so ACOI can inform them of your recognition. Click here. 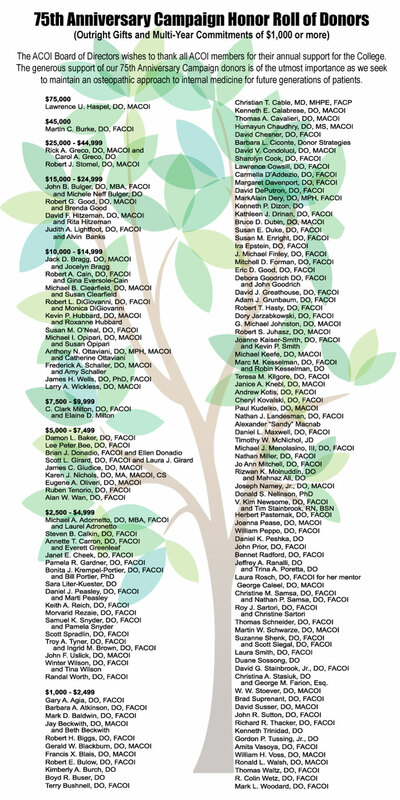 Record Year for Contributions to ACOI!